The service man was on time and called before he arrived! plus. Plus got an email to remind me of the appoint. 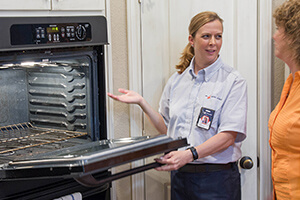 The service man was friendly, on time, fixed the appliance correctly. The technician was very professional and friendly. He was completely transparent with all costs for the needed repairs. The technician was excellent. He fixed the problem, was easy to work out a time, very nice. He really seemed to know his stuff, good experience. The service tech was very professional and helpful. I would recommend Mr. Appliance to other people with similar needs.Thank you for your help. Courteous, on time , and excellent work.